The Kerguelen plateau is a large igneous province (LIP) at the base of the Indian ocean on the Antarctic plate. It is widely considered to be the product of dynamic interactions between a mantle plume, continental shelves, mid ocean ridges and oceanic sea floor. 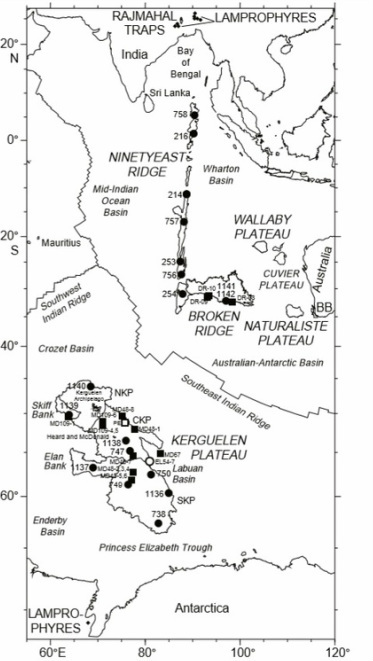 The Kerguelen plateau, the Nineyeast Ridge and the Broken Ridge all originated from the Kerguelen Plume (Frey et al.). The Keguelen Plateau, true to its plume source, is mostly composed of tholeiitic flood basalts (Duncan). 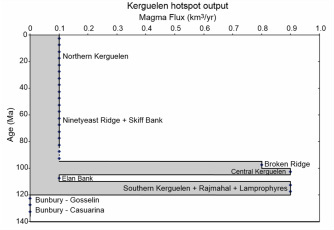 The Central Kerguelen Plateau (CKP) is though to be consequence of one of the latter mentioned large magmatic events. In the south Kerguelen Plateau (SKP) however, in addition to the tholeiitic basalts, fragment of the Antarctic continental plate remain (Frey et al.). The Elan bank is composed almost entirely fro­m the continental material and is considered to be a micro-continent having seperated from the Indian plate (Coffin et al.). The creation of the Nineyeast Ridge is attributed to the spreading of the sea floor over the head of the hotspot. Similarly, as the spreading ridge passed over the mantle plume, it separated what is now the Kerguelen Plateau and the broken ridge. Indeed, the petrology of the Northern Keguelen Plateau (NKP) and that of the Nineyeast Ridge reflects contributions from both the hotspot and depleted upper mantle material from the spreading ridge (Frey et al.). Although the Kerguelen plateau is now almost completely submerged, dredges and core samples suggest that at its creation the plateau was subarial (Duncan). Indeed, estimates suggest that, at its maximum, the plateau may have been up to ~1-2km in elevation. Subsidencence would be the concequence of thermal cooling (Frey et al.). All that remain to this day is the Kerguelen Islands and the Heard and Mcdonald Islands. The later is thought to be the present location of the Kerguelen hotspot and displays intermittent volcanism. The geological complexity of the Kerguelen Plateau makes it an ideal candidate to study wide range of tectonic mechanisms as well as there respective interactions. Frey, F. A., 2000. Origin and evolution of a submarine large igneous province: the Kerguelen Plateau and broken ridge, Southern Indian ocean. Elsevier, 176 (1), 73-89. Duncan, R. A., 2002. A time frame for construction of the Kerguelen Plateau and broken ridge. Journal of Petrology, 43 (7), 1109-1119. Frey, F. A., Coffin, M. F., Wallace, P. J., Weis, D., 2003. Leg 183 synthesis: Kerguelen Plateau-Broken Ridge—a large igneous province. In Proceedings of the Ocean Drilling Program, scientific results, 183, 1-48.